Jack Marriott was born on 19 January 1920 in the small village of New Smithy in the Derbyshire Peak District, and went to the local village school at Chinley. He was a factory worker in a local bleach works before the war. 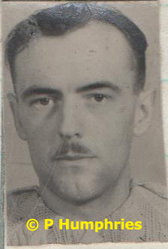 At its outbreak, he joined the RAF and worked as ground crew. As soon as the opportunity arose for experienced mechanics to retrain as heavy bomber flight engineers Marriott volunteered and after training was posted to 50 Squadron at Skellingthorpe. There he quickly gained a good reputation and was seen as setting a very high standard. When Henry Maudslay joined the squadron, Marriott soon became his regular engineer, and flew with him on a number of operations before they were posted to 617 Squadron on 25 March 1942. When he left 50 Squadron, his CO recommended him for a DFM citing his ‘efficiency and enthusiasm for operational flying and his determination in helping to hit the targets’ as meriting the award. Sadly, it was only confirmed in July 1943, after his death, but was reported in the local press. Like his comrades, Jack Marriott is buried in Reichswald Cemetery. Next Article BBC Dambusters Pictureboard completed! Hi. Being a Melburnian (Australia) I’m very curious if you have featured the, to me, local born F/L Barlow. Carlton, a Melbourne inner suburb. Second wave, crashed going in, all killed. ‘H’, ‘Harry’. An article in a May UK newspaper re the erecting, lately, of a memorial on the site of the crash. A German historian. Another sad story. Laurie. ex RAAF Lincolns, 1950’s.